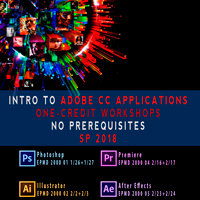 The School of Communications is again offering Adobe Creative Cloud one-credit workshops. The School of Communications is again offering a series of weekend, one-credit seminars that introduce students to several Adobe applications starting in the Spring 2018. The courses are prerequisite-free, open to anyone at Webster, and will meet Friday from 5:30-9:30 p.m. with a full day on Saturday. As of early December there are still plenty of seats available. The courses are offered early in the semester so that students are able to utilize the skills in their respective courses immediately in the fall semester. Jan. 26-27: EPMD 2000 01: Photoshop: Image editing and compositing. Feb. 2-3: EPMD 2000 02: Illustrator: Vector graphics and illustration. Feb. 9-10: EPMD 2000 03: InDesign: Page design and layout for print and digital publishing. Feb. 16-17: EPMD 2000 04: Premiere Pro: Video production and editing. Feb. 23-24: EPMD 2000 05: After Effects: Cinematic visual effects and motion graphics. Mar. 2-3: EPMD 2000 06: Audition: Audio recording, mixing, and restoration.